The AN/PRC-148 Multiband Inter/Intra Team Radio (MBITR) is the most widely fielded handheld multiband, tactical software-defined radio, in use with NATO forces around the world. The radio is built by Thales Communications, a subsidiary of the Thales Group. The designation AN/PRC translates to Army/Navy Portable Radio used for two way Communications, according to Joint Electronics Type Designation System guidelines. 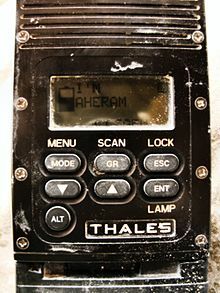 The MBITR was developed by USSOCOM and Thales Communications in the 1990s and went into production in 1994, to address the need for a secure multiband handheld radio. It has been more widely deployed with Stryker Combat Teams and with troops deploying to Iraq and Afghanistan. As of August 2007, 100,000 MBITRs have been fielded, over 31,000 of which are in use by the US Army. The standard AN/PRC-148 MBITR can be seamlessly upgraded to the AN/PRC-148 V3/V4 JEM, which is the first radio to be JTRS Software Communications Architecture 2.2 compliant. The radio is upgraded by replacing the front panel and COMSEC control hardware assemblies. The radio is in production and has been fielded with USSOCOM. The AN/PRC-6809 MBITR Clear is a variant of the MBITR, made available without encryption. While the PRC-148 includes US Type 1 capabilities in all versions, the PRC-6809 uses Level III DES, making it available to police, firefighters, and militaries unable to obtain ITAR approval. 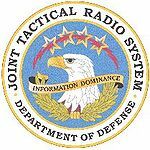 While the JEM has passed government certification, it is an evolutionary platform, and not fully compatible with all specifications of JTRS. The fully compatible system is the JTRS HMS, (Handheld, Manpack and Small form-fit) being developed by General Dynamics, and expected to be introduced in 2010. Thales Communications, BAE Systems, and Rockwell Collins are all prime subcontractors. The HMS is expected to be an integral part in the US Army's Future Combat Systems program. The MBITR's primary competition comes from Harris Corporation's AN/PRC-152 software defined radio, which has also received SCA and NSA certification. The ViaSat Data Controller (VDC-600, VDC-800, or VDC-850) acts as a Networking Interface Card (NIC), enabling seamless integration of IP-based applications into a point-to-point RF network. The device is built by Viasat. MELANIE allows collecting GPS data from user nodes (also in ANDVT radio mode) and to provide a robust military interface to connect MBITR to PC (or Android tablet). MELANIE is connected to external connector of MBITR and forwards data/audio connection for C4OPS and for RCU. Data connection by USB or RS-232. Typical BFT configuration of a MELANIE network consists of at least a Headquarter station plus user nodes. MELANIE Handheld is able to send own position over the VHF or SAT network while exchanging data (Chat, File transfer, Video, TR@CER, etc.). In transparent mode it has a throughput of 13,5 kbit/s with FEC. The device is built by Thales Italia Chieti Site., a subsidiary of the Thales Group. The compact, rugged Vehicle Adapters and Vehicle Adapter Amplifiers for the combat-proven AN/PRC-148 family of multiband inter/intra team radios expand critical communication capabilities and open up a broad range of secure and anti-jamming voice and data applications. Easily mounted in air, land, or sea vehicles, they provide power amplification for range extension while recharging the installed AN/PRC-148 radios. ^ a b c d e f g h i j k l m n o p q r s t u v w x y z aa ab ac ad ae "MBITR AN/PRC-148(V)(C) Multiband Inter/Intra Team Radio Datasheet" (PDF). Thales. Archived from the original (PDF) on 2006-11-15. Retrieved 2008-04-07. This page was last edited on 15 January 2019, at 06:30 (UTC).